Boston, Massachusetts (February 7, 2019)– From the Top, the nationwide program distributed by NPR that showcases classically-trained young musicians, is very pleased to announce that American pianist Simone Dinnerstein, known for her “majestic originality of vision” (Independent), will guest host a live concert recording at the Texas State International Piano Festival on June 8, 2019 as part of From the Top’s 2018-2019 season. American pianist Simone Dinnerstein first attracted attention in 2007 with her self-produced recording of Bach’s Goldberg Variations. It was a remarkable success, reaching No. 1 on the U.S. Billboard Classical Chart and establishing Dinnerstein’s distinctive and original approach. Her career has since taken her around the world from Brazil to Japan, and she has released eight albums with repertoire from Beethoven to Ravel. 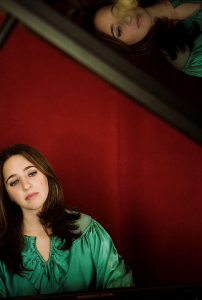 Dinnerstein spent 2018 touring Philip Glass’s Piano Concerto No. 3, a work that he wrote for her as a co-commission by twelve orchestras. Dinnerstein released Mozart in Havana in 2017, recorded in Cuba with the Havana Lyceum Orchestra. Also in 2017, she collaborated with choreographer Pam Tanowitz to create New Work for Goldberg Variations, which was on the year-end top ten lists of critics at the New York Times and Boston Globe. Visit simonedinnerstein.com for more information. From the Top’s 2018-2019 season begins a new chapter in the program’s history. A lineup of renowned artists will host, co-host or appear as special guests on live recordings throughout the season, many of whom are FTT alumni, and who have diverse backgrounds and musical perspectives. Please visit fromthetop.org/events for the complete 2018–2019 From the Top season. FTT Green Room is Launched! The From the Top Green Room is a place for young musicians to share news, advice and more! Thanks for reading.